In January, a class of thirty Year 6 pupils from the Lansbury Lawrence Primary School were invited to participate in a month-long project with the V&A exploring the history of the Lansbury Estate, the historic significance of their Grade II listed school and the ceramic tile designs of artist Peggy Angus. Formerly the ‘Susan Lawrence Primary’ and ‘Elizabeth Lansbury Nursery’, the Lansbury Lawrence was built to the designs of Yorke, Rosenberg and Mardall for the London County Council, replacing schools that were bombed in the early 1940s. The buildings were the first to be reconstructed as part of the ‘Live Architecture’ exhibition of 1951 and among the first in the country to respond to the Education Act of 1944. As a central component of the newly created welfare state, the Act stipulated that school architecture meet the needs of modern and inclusive teaching methods. With its innovative steel-frame grid system, prefabricated concrete elements and well-proportioned child-friendly spaces, the school was the most admired of all the ‘Live Architecture’ exhibition buildings. Its wide appeal was due also to its vibrant interior scheme, which was developed in collaboration with artist and industrial designer Peggy Angus. The professional ethos of the time, which embraced collaboration between construction and artistic discipline, is evident to this day in the two large-scale murals by Angus in the school’s entrance lobby and dining hall. 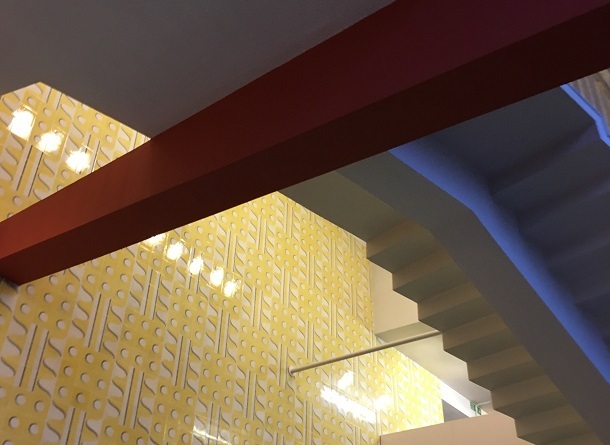 In the foyer, an abstract composition in white and lemon-yellow ceramic tiles covers the main wall of the double-height space, providing a striking backdrop to the school’s distinctive fly-over staircase. It was fantastic to see that such a distinctive feature is as much-loved today- by pupils and teachers alike- as it was when originally conceived. Fun in front of the Peggy Angus tile murals at the school. Taking inspiration from Peggy Angus’s approach to the school’s interior and guided by ceramicist and former V&A artist-in-residence Matt Raw, pupils at the Lansbury Lawrence set about designing and creating their own set of ceramic tiles. Below is a series of images documenting the project. To kick off the project, pupils visited the Lansbury Micro Museum to see its first exhibition New Beginnings. 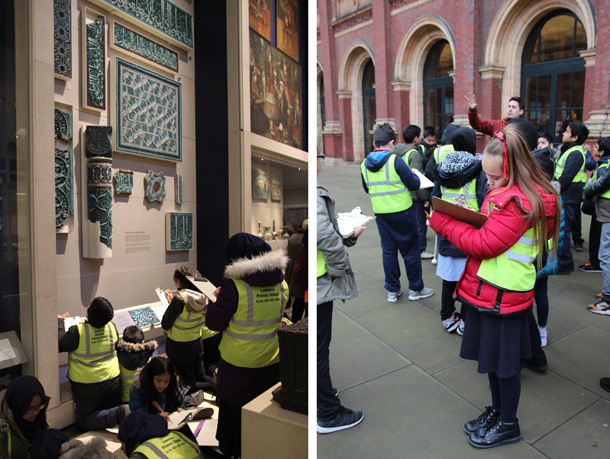 A day-trip to the Victoria and Albert Museum in South Kensington allowed the Lansbury Lawrence pupils to discover further examples of architectural tilework and explore ceramic styles from around the world. Led by Matt, they collected ideas for using pattern and colour, and learned about techniques in glazing. Back at school, the pupils worked with Matt over four mornings to design and create their own ceramic tiles. Pupils glazed the tiles in a palette inspired by the Peggy Angus murals. 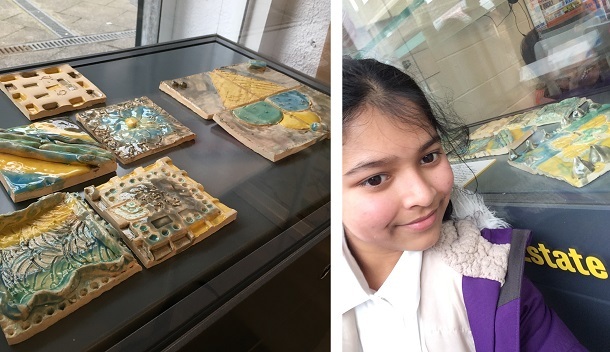 Whilst a small display of the pupils’ completed tiles can now be seen in the Lansbury Micro Museum as part of the exhibition New Horizons 1950s-1980s, visitors can expect to see an architectural feature made of them for our next display. 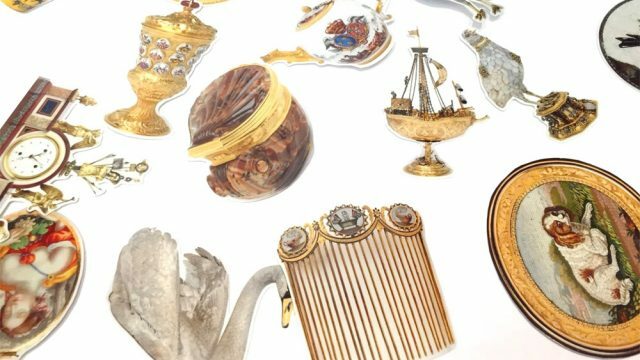 Teachers from schools on the Lansbury Estate, as well as those from further afield, were also invited to explore the themes of the Micro Museum and the design of the Lansbury Lawrence Primary School in a special ‘satellite’ V&A Sanctuary. 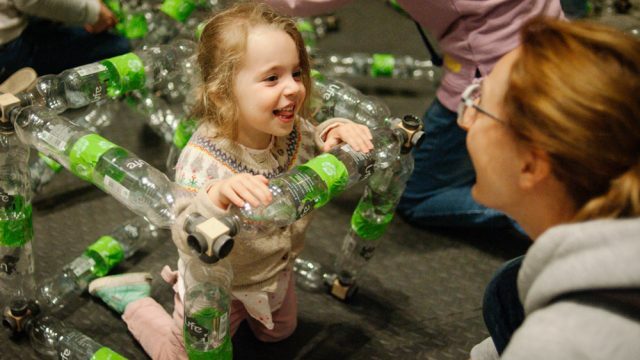 Conceived to offer teachers the opportunity to explore different creative practices and techniques, the Sanctuary runs monthly at the museum with a different artist/designer as host each time. For this East London-based session we invited Alicja Borkowska of playful, multi-disciplinary design practice You+Me Architecture to lead a hands-on investigation of the school site and its history, including a trip to the Lansbury Micro Museum and creative workshop in the Lansbury Lawrence’s dining hall. The teachers considered how the school’s spaces might be reimagined or animated to support learning activities whilst referencing and celebrating the site’s unique architectural heritage.